A simulation of the silhouette of planet 55 Cancri e transiting its parent star, compared to the Earth and Jupiter transiting our sun, as seen from outside the solar system. The star 55 Cancri A is nearly a twin of the sun. Astronomers have pinned down some details of an exotic nearby alien planet that's almost as dense as lead. Astronomers previously thought 55 Cancri e took about 2.8 days to orbit its parent star. But the new study reveals that the exoplanet is so close to its host star that it completes a stellar lap in less than 18 hours. "You could set dates on this world by your wristwatch, not a calendar," study co-author Jaymie Matthews, of the University of British Columbia, said in a statement. The super-dense alien world is part of a multiplanet solar system about 40 light-years from Earth, in the constellation Cancer (The Crab). 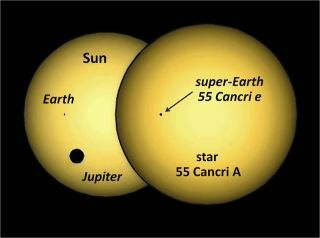 Its sunlike parent star, 55 Cancri, is bright enough to be seen from Earth by the unaided eye, researchers said. This wide-angle photograph of the night sky shows the location of 55 Cancri, a star where astronomers have found five planets, including a hot, dense super-Earth. Initially, astronomers thought 55 Cancri e had an orbital period of about 2.8 days. But last year, two researchers -- Harvard grad student Rebekah Dawson and Daniel Fabrycky of the University of California, Santa Cruz -- re-analyzed the data. They suggested that the alien planet might actually zip around its host star much faster than that. So Dawson and Fabrycky joined up with a few others to observe 55 Cancri e more closely. The team trained Canada’s MOST (Microvariability & Oscillations of STars) space telescope on the planet's star, then watched for the tiny brightness dips caused when 55 Cancri e passed in front of -- or transited -- it from the telescope's perspective. This is the same technique used by NASA's prolific Kepler space observatory, which has found 1,235 alien planet candidates since its March 2009 launch. The team found that these transits occur like clockwork every 17 hours and 41 minutes, just as Dawson and Fabrycky had predicted. The starlight is dimmed by only 0.02 percent during each transit, telling the astronomers that the planet’s diameter is about 13,049 miles (21,000 kilometers) -- only 60 percent or so larger than Earth. Using this information, the researchers were able to calculate 55 Cancri e's density. “It’s wonderful to be able to point to a naked-eye star and know the mass and radius of one of its planets, especially a distinctive one like this,” said study lead author Josh Winn of MIT. The research was released online Friday at the website arXiv.org, and it has been submitted for publication in The Astrophysical Journal Letters. "Because of the infernal heat, it’s unlikely that 55 Cancri e has an atmosphere," Winn said. "So this is not the type of place where exobiologists would look for life." If you could somehow survive the heat, however, the view from the planet's surface would be exotic and spectacular. “On this world -- the densest solid planet found anywhere so far, in the solar system or beyond -- you would weigh three times heavier than you do on Earth," Matthews said. "By day, the sun would look 60 times bigger and shine 3,600 times brighter in the sky." But the appeal of 55 Cancri e is not limited to such gee-whiz factoids. Because it's so close to Earth, the planet and its solar system should inspire all sorts of future work, researchers said. "The brightness of the host star makes many types of sensitive measurements possible, so 55 Cancri e is the perfect laboratory to test theories of planet formation, evolution and survival," Winn said.